Wisconsin Chunky Board...what a great way to celebrate the great state of Wisconsin! This amazing cutting board is approximately 11" tall x 11.5" wide and 1.5" thick (hence the "chunky"). Makes the perfect board for serving Wisconsin Cheese. Available in: Walnut with "Cherry Door County" and Walnut/Cherry Combination. Comes with rubber feet to avoid movement when cutting on it and to keep moisture away. Don't forget to order a spreader to go with your Wisconsin Chunky Board. 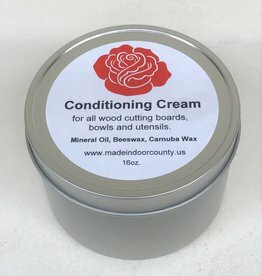 Also, Wood Conditioning Cream to keep this and all your boards looking amazing!